In literacy circles, English Learners are at the forefront of many educational leadership discussions: how can we provide them with the very best literacy instruction? How can we improve their English fluency, help them become comfortable with English texts, and with speaking aloud in class? How can we teach them academic language and help them meet standards? How — perhaps most importantly — can we honor their culture, their previous language(s), and celebrate bilingualism as an asset rather than viewing it as an obstacle to be overcome? In literacy, English Learners are seen as a diverse, growing, and inspiringly motivated group of learners with unique instructional needs who face educational, cultural, and social obstacles. But in other subjects, where reading fluency is not the primary learning objective, ELs can be overlooked. Their needs are not always addressed, and their remarkable language competencies are seldom celebrated. But there are some programs, and some schools, that are attempting to change that. First, it acknowledges both the significance of a student’s culture and recognizes their remarkable achievement in working bilingualism. Math, truly, is a language unto itself. Now, imagine engaging and utilizing two more languages while you solve a math problem. It is a truly impressive feat! Second, it demonstrates a genuine, driving effort to empower these students to succeed. Depriving them of the use of their first language while they are attempting to build core numerical competencies necessary to succeed in the classroom, in higher education and in the workforce does our young learners no favors. ALEKS provides students with every tool that they need to meet Mathematical Content Standards and to grow as learning mathematicians, all while engaging in exceptional language practice. ALEKS empowered an entire school district to drive positive learning outcomes in mathematics, and didn’t leave English Learners behind. By providing instruction in both English and Spanish, students who had a greater degree of comfortability with Spanish were able to learn in an environment best suited to maximize content mastery. The toggling feature enabled students and teachers to work cross-linguistically and cross-culturally, the ultimate in collaborative and productive instruction. 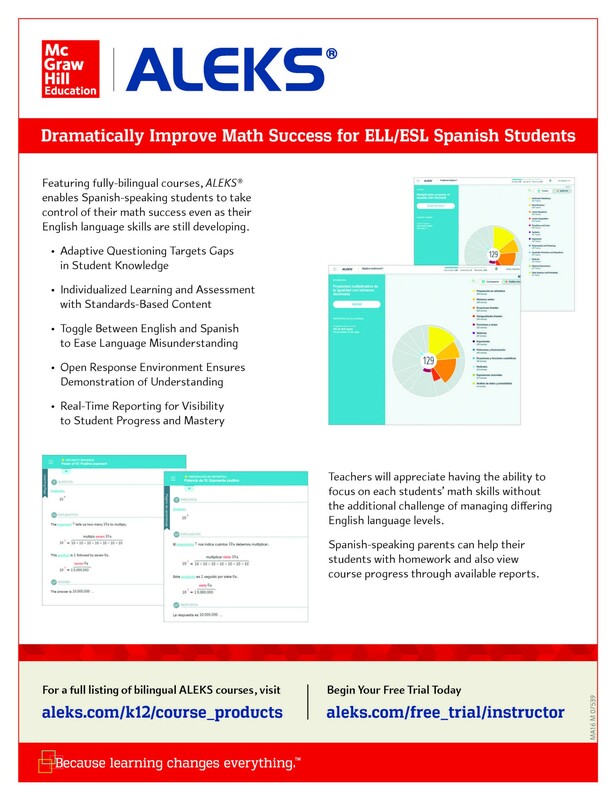 To learn more about how ALEKS can empower the English Learners in your district to reach new heights in mathematical competencies while practicing biliteracy, check out the flyer below and visit the ALEKS homepage.